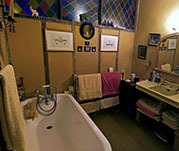 This is a large carpeted bathroom, boasting a period roll-top bath with a shower tap. The large had-basin and attendant furnishings all reflect the period of the house. A non-refundable deposit is requested on advance bookings. We request that you send either 20% of the room booking or £20 whichever is the greater. The room will be reserved for three working days from a verbal or email booking, pending receipt of the deposit. Cheques are acceptable, made payable to Carol Stott. Arrival is normally between after 4:00pm and departure by10:30am. Should you find these times inconvenient, please discuss your requirements when booking.. Cancellations or failure to take up reservation In the event of cancellation or failure to take up a reservation, we, at our discretion, retain the right to make a full charge should we be unable to re-book the room. For the convenience of other guests the house is a non-smoking area, although you are welcome to smoke in the garden. or failure to take up a reservation, we, at our discretion, retain the right to make a full charge should we be unable to re-book the room.